Source: Adapted from ref. 11.
include attempts to correct the underlying complication, such as coronary reperfusion in the presence of a myocardial infarction/ischemia; antiarrhythmic drugs to restore and maintain normal sinus rhythm; electrical therapies such as antitachy-cardia pacing, cardioversion, defibrillation; and ablation performed surgically or with the assistance of a catheter. The role of medical devices in the management of these arrhythmias will become clear as device function is described in the remainder of this chapter. As was the case for the pacing indications discussed here, the indications for an ICD are also complex. The current indications by class are shown in Table 7 (11). External defibrillators have become ubiquitous. In addition to traditional use in hospitals and by paramedics, these systems are now commonly found in many schools, public buildings, airports, and homes. 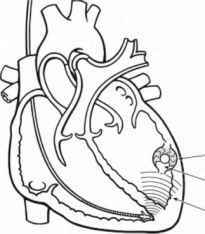 As with implantable cardioverter-defibrillators, these systems are used to treat sudden cardiac death. These external systems deliver high-energy shocks (up to 360 J) to the chest of the patient using either patches or paddles. one electrode is typically placed in the right pectoral region and the second in the left axilla for delivery of the energy (Fig. 20). 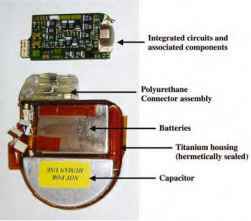 Similar to a pacemaker, an ICD is a self-contained, implantable computer with an integral pulse generator and battery. In addition to providing pacing therapies for bradyarrhythmias and tachyarrhythmias, ICDs also deliver high-energy discharges. The major components of an ICD include a battery, electronic circuitry and the associated components, high-voltage capacitors, high-voltage transformers, a telemetry antenna, a reed switch triggered on application of a magnetic field, and a connector block. Fig. 20. An external cardiac defibrillator or automatic external defibrillator (LIFEPAK® 500, Medtronic, Inc., Minneapolis, MN). Fig. 21. The inner workings of a modern implantable cardioverter-defibrillator (ICD). A portion of the titanium housing has been removed to expose the typical internal components. The componentry is most commonly housed within a hermetically sealed stamped titanium case. Feedthroughs connect the internal circuitry to an external connector block, which acts as the interface between the internal circuitry of the ICD and the leads. The connector block is commonly fabricated from a molded polyurethane superstructure, which houses metallic contacts for interconnection with the leads. The contacts may be simple machined blocks or spring-type metallic beams. The connector block often has set screws to ensure permanent retention of the leads. A cutaway view of an ICD can be found in Fig. 21. Today, most ICDs will use one or two batteries with silver lithium vanadium oxide chemistry. A typical full charge of this type of battery is 3.2 V. As the ICD battery energy starts to deplete, the voltage will follow the path shown in Fig. 22, in which there are two characteristic plateaus. The voltage is provided to the clinician on device interrogation to determine if the battery is at beginning of life, middle of life, elective replacement indicator, or end of life (35). Each manufacturer and each device from a given manufacturer will have its own elective replacement indicator voltage. This value is representative of the voltage, current drain from the circuitry, and characteristics of the capacitor used. All devices should be replaced before end of life is reached, as this may prolong charge times and postpone needed therapy. 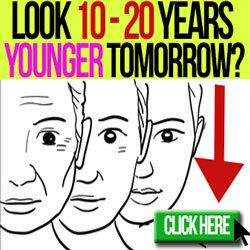 The longevity of the device depends on the number of therapies delivered, but is typically 6-8 years. 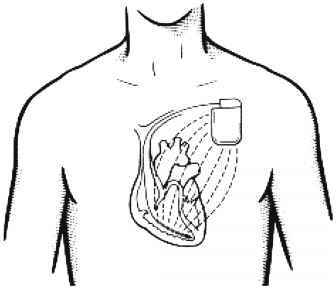 The primary function of the ICD's capacitor is the accumulation and storage of an adequate amount of energy to shock-terminate a fibrillating heart. As mentioned, a typical voltage of an ICD battery is 3.2 V, whereas the capacitor can store up to 800 V (delivering an energy between 30 and 35 J). Periodic conditioning of each capacitor is required to maintain charge efficiency and therefore guarantee short charge times to allow rapid conversion of the arrhythmia (36). The materials currently used in the capacitors slowly lose efficiency, especially when they are not used for a period of time because of a chemical decay process. This process (termed deformation) is mitigated by conditioning the capacitors (termed reformation). Fig. 22. 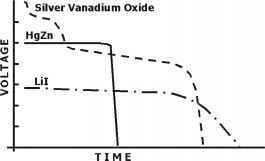 A typical example of an implantable cardioverter-defibrillator (ICD) depletion curve for a silver vanadium oxide battery. Lithium iodide (LiI) and mercury zinc (HgZn) battery examples are included for comparative purposes. Reforming of the capacitor should be performed regularly by charging the capacitor to its maximum capacity and leaving the charge on it until it gradually discharges the energy. Fortunately, reformation can be easily programmed at regular intervals in most modern devices (e.g., every 6 months). It is desirable for an ICD to be able to sense ventricular rhythms that vary in amplitude, rate, and regularity accurately to distinguish among normal sinus rhythm, ventricular tachycardia, ventricular flutter, ventricular fibrillation, and supraventricular (atrial) arrhythmias (see examples in Fig. 23). Current devices adjust their sensitivity on a beat-to-beat basis to sense fine waves of ventricular fibrillation and to avoid oversensing of intrinsic T waves. If an ICD undersenses (misses cardiac activity that it was intended to detect), the device may fail to treat ventricular flutter or may fail to treat a ventricular tachycardia, which subsequently may accelerate into ventricular fibrillation. If an ICD oversenses, overestimating the cardiac rate, it may deliver inappropriate therapy, which will lead to patient discomfort, or more seriously, it may even induce a tachyarrhythmia. Fig. 23. Ventricular fibrillation and the associated device response (refer to the marker channel). Fig. 24. Tachyarrhythmia detection intervals. The top three traces represent typical electrocardiograms that might be encountered by the device. 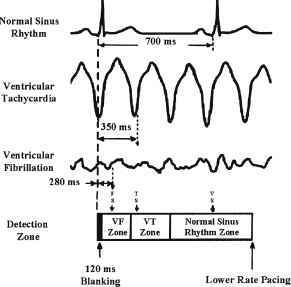 The detection zones for ventricular fibrillation, ventricular tachycardia, and sinus rhythm are shown at the bottom. Note that an event with a cycle length of 700 ms is categorized as sinus rhythm, 350 ms as ventricular tachycardia (VT), and 280 ms as ventricular fibrillation (VF). 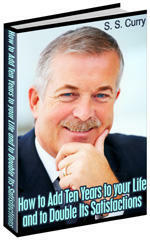 The steps involved in sensing and detection are similar to those discussed previously for the pacemakers. In fact, almost all ICDs on the market today include the pacing algorithms described earlier, with additional functionality/logic for detection and treatment of tachyarrhythmias. Arrhythmia detection typically occurs via the following steps: (1) sense the R wave or P waves; (2) measure the interval or cycle length between consecutive beats; and (3) compare the cycle length to prescribed detection zone intervals to classify the arrhythmia (Fig. 24). For simplicity sake, this chapter focuses on only two detection zones: the ventricular fibrillation zone and the ventricular tachycardia zone. A fibrillation zone is commonly programmed to detect any interval faster than the interval prescribed by the clinician (e.g., 320 ms = 187.5 beats/min). If a minimum number/percentage of beats is sensed within this interval, the rhythm will be detected as ventricular fibrillation, and the device will treat the rhythm using the high-energy shock amplitudes preprogrammed by the clinician. During the process of arrhythmia detection, the device counts the number of events in each of the detection zones and compares them to prescribed rules to classify the arrhythmia. Most ICD designs employ two different counters when classifying whether an arrhythmia is ventricular fibrillation or ventricular tachycardia. Typically, the ventricular fibrillation counter uses a probabilistic approach. Because ventricular fibrillation waves are chaotic and vary in amplitude and cycle length, the device will look for a programmed percentage of cycle lengths to fall within the fibrillation detection zone (e.g., 75%; Fig. 25), and if that criterion is met, the device will detect ventricular fibrillation and deliver the appropriate therapy. Ventricular tachycardias, on the other hand, usually have a regular cycle length. 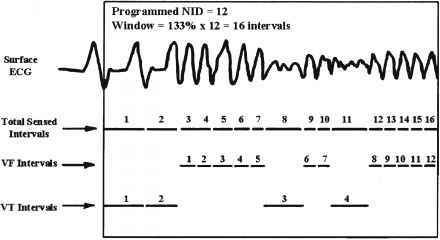 A consecutive event counter is used, which states that a programmed number of cycle lengths (e.g., 18 of 18) needs to be within the tachycardia detection zone to classify the rhythm as ventricular tachycardia. If one cycle length falls out of the ventricular sense zone, the consecutive counter is reset to zero, and the count begins again. Each ICD has the capability to redetect the same arrhythmia if the initial therapy was not successful. Redetection criteria will often be more aggressive (fewer number of beats sampled) than the initial detection criteria to ensure that subsequent therapies can be delivered quickly. An example of when the redetection criteria may not be as aggressive is when the patient has a long QT interval and is prone to developing torsade de pointes, which may spontaneously terminate. Fig. 25. An example of an implantable cardioverter-defibrillator (ICD) device record including 16 consecutive beats and their classification. Because 12 of 16 events (75%) were within the ventricular fibrillation (VF) detection zone, the arrhythmia would be classified as ventricular fibrillation, and high-voltage shocks would be delivered. ECG, electrocardiogram; VT, ventricular tachycardia. Devices today have the option of programming an additional detection zone, which is referred to as a fast ventricular tachycardia zone. This is a zone that can be programmed for those patients with a fast ventricular tachycardia who may benefit from antitachycardia pacing. Treating a fast ventricular tachycardia with antitachycardia pacing may decrease the number of high-voltage shocks delivered, increasing the patient's quality of life and prolonging device longevity (37). Evidence of the benefit of this therapeutic approach was seen in the PainFREE Rx trial, which concluded that fast ventricular tachycardias with ventricular cycle lengths less than 320 ms could be terminated by antitachycardia pacing three out of four times with a low incidence of acceleration into ventricular fibrillation and syncopal episodes (37). If a fast ventricular tachycardia zone is programmed, the device will always ensure that the most aggressive therapy is delivered. For example, if a fast ventricular tachycardia has been detected, the device will verify that no ventricular fibrillation intervals fell within that fast ventricular tachycardia zone before delivering anti-tachycardia pacing. When targeting treatment of ventricular arrhythmias, it is important to verify that the arrhythmia is of ventricular origin. Each manufacturer will have a unique algorithm for distinguishing a supraventricular (atrial) tachycardia from a ventricular tachycardia. This is very important to avoid inappropriate shocking of a patient with sinus tachycardia caused by exercise or an atrial arrhythmia (atrial fibrillation or atrial flutter). Fig. 26. Antitachycardia pacing therapy. A pacing stimulus is applied to entrain an excitable gap in the reentrant circuit. This disrupts the reentrant circuit and terminates the tachycardia. ATP, antitachycardia pacing. pacing (delivering the least amount of energy), followed by cardioversion, and finally by defibrillation. Each of these therapies can be programmed as to the physician's preference. Antitachycardia pacing is typically used in a clinical situation when one reentrant circuit is repeatedly activating the ventricles and causing a rapid, but regular ventricular tachycardia. The goal of the antitachycardia pacing therapy is to deliver, via a pacing stimulus, a depolarization wave into the area of the excitable gap (an area of repolarized tissue) of the reentry circuit. Recall that a reentrant circuit causes the majority of tachyarrhythmias. Thus, if a pacing pulse reaches the excitable gap before a new wavefront of the reentrant circuit, the reentrant activity is terminated (Fig. 26). Fig. 27. Electric field between high-voltage electrodes during a shock; note that the implantable cardioverter-defibrillator (ICD) is functioning as one of the electrodes. Fig. 28. Examples of successful defibrillation (top electrogram) and cardioversion (lower electrogram) therapies. VF, ventricular fibrillation; VT, ventricular tachycardia. Cardioversion and defibrillation shocks are high-energy shocks delivered between two or more high-voltage electrodes, one of which is typically the ICD itself (the titanium housing acts as an electrode). The goal of these shocks is to defibrillate a critical mass of the myocardial cells that are depolarizing at a rapid, but irregular rate (Figs. 27 and 28). Cardioversion can be described as a noncommitted highvoltage shock because the shock needs to be synchronized to a R wave, or the shock will not be delivered. Cardioversion shocks are used to treat ventricular tachycardias or regular fast ventricular tachycardias. Therefore, the shock is delivered on a R-wave that has been detected in the tachycardia detection zone. If the shock would happen to be delivered on a T wave, the underlying arrhythmia could be dangerously accelerated into ventricular fibrillation, which is why a cardioversion shock will be aborted if it is not synchronized to a R wave. The chaotic nature of ventricular fibrillation is treated by delivering a committed asynchronous shock. Both cardioversion and defibrillation gain their energy from the discharge of the ICD's high-voltage capacitor. Depending on the manufacturer, each device will offer a number of programmable therapies per detection zone, all of which are programmed to physician preferences. The programming of the defibrillation therapy is often based on a specific patient's defibrillation threshold. This threshold is defined as the minimum amount of energy needed to rescue the heart from the fibrillating state (various algorithms exist for determining this energy). The physician typically prefers to set the first defibrillation therapy at an energy output greater than the defibrillation threshold to provide a margin of safety for the patient. A safety margin of at least 10 J greater than the defibrillation threshold is commonly used. For example, if a patient's defibrillation threshold has been determined as 15 J, the device will be programmed to deliver its first therapy at 25 J. Therefore, the maximum output of the device needs to be considered when assessing an appropriate safety margin. If a device has a maximum output of 35 J and the patient's defibrillation threshold is 27 J, there would only be an 8-J safety margin. The typical shock waveforms delivered by the ICD have evolved over time. 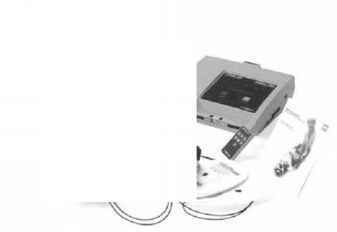 Early systems used a monophasic waveform delivered between a dedicated set of electrodes (i.e., delivered with a constant direction of current flow, or polarity). Later, sequential monophasic shocks between selected pairs of electrodes were offered because they were found to produce lower defibrillation thresholds in certain patients. Today, devices typically use a biphasic shock that reverses polarity during the discharge of the capacitors (Fig. 29). The development of the biphasic waveform was considered a significant improvement in ICD technology, and they have been almost exclusively used since the mid-1990s (38). The percentage of the drop in voltage, prior to termination of the waveform in the current polarity, is known as tilt. Tilt is measured from the instant the current starts to flow in one direction (leading edge) to the time that it ends its flow in that same direction (trailing edge). A tilt value can be measured for each direction that the current is flowing: Typical tilts are between 50 and 65% (Fig. 30). As mentioned, most modern ICDs also include pacemaker functionality. Table 8 provides a final summary of the similarities and differences between IPGs and ICDs. Fig. 29. Monophasic and biphasic shock waveforms. Fig. 30. Determination of the percentage tilt of a defibrillation waveform. LE, leading edge; TE, trailing edge. • Battery optimized for long-term, low current use lation thresholds. Therefore, the use of antiarrhythmic drugs with ICDs can decrease the frequency or amplitudes of therapeutic shocks, thereby increasing both patient comfort and prolonging battery longevity (39). In addition to the benefits, there are also potentially undes-ired consequences associated with the concurrent use of ICDs and antiarrhythmic drugs (13). Specifically, antiarrhythmic drugs may: (1) alter the detection of the arrhythmia, leading to an increase in the duration of a tachyarrhythmia; (2) increase defibrillation thresholds, making it more difficult to defibrillate the heart successfully; (3) slow the rate of the tachyarrhythmia so much that it no longer falls within the detection zone for both antitachycardia pacing and shock; and/or (4) prolong the width of the QRS complex on the ECG causing double counting and hence inappropriate shocks. The typical antiarrhythmic drugs that affect defibrillation thresholds are: (1) type I agents, those with sodium channel blocking activities and the membrane stabilization effects; (2) P-blockers and calcium channel antagonists because of their effects on the nodal tissues; and (3) type III agents, which may increase or decrease defibrillation thresholds after long-term therapy (Table 9). Amiodarone has been reported to increase defibrillation thresholds after chronic use.